On the first day, the 10 Day Film Challenge will distribute to the classroom teacher a list of genres to be drawn from a hat for each filmmaking team. Then each team is assigned the same character, that character's backstory, a prop and a line of dialogue. The cinematic technique will be revealed PRIOR to Day 1 AND IS OPTIONAL. The teacher will then distribute this information to the students. These elements must appear in the student-made film in some way. All teams in your state will have the same required elements in their films. The only difference is the GENRE. Possible genres that will be sent to the classroom teacher to be drawn at random by the student filmmaking groups on Day 1 may include, but are not limited to ROMANCE; SUSPENSE; THRILLER; SCI-FI; FANTASY; FOREIGN; SILENT; BUDDY FILM; FISH OUT OF WATER; SUPERHERO; MISTAKEN IDENTITY, UTOPIAN/DYSTOPIAN FICTION; MONSTER MOVIE; SLICE OF LIFE; SPORTS/GAMES; MOCKUMENTARY; SUPERHERO. It will be VERY helpful to review these genres with your students prior to the Challenge. You do not want to waste time on Day 1 explaining what exactly these genres are. SPECIAL RULE FOR GENRE: Any filmmaking team may trade-in the genre they "pick from a hat" on Day 1 and replace it with a special genre. We will announce this special trade-in genre on Day 1. EVERY film in the Challenge will have the SAME cinematic technique appear somewhere in their film. 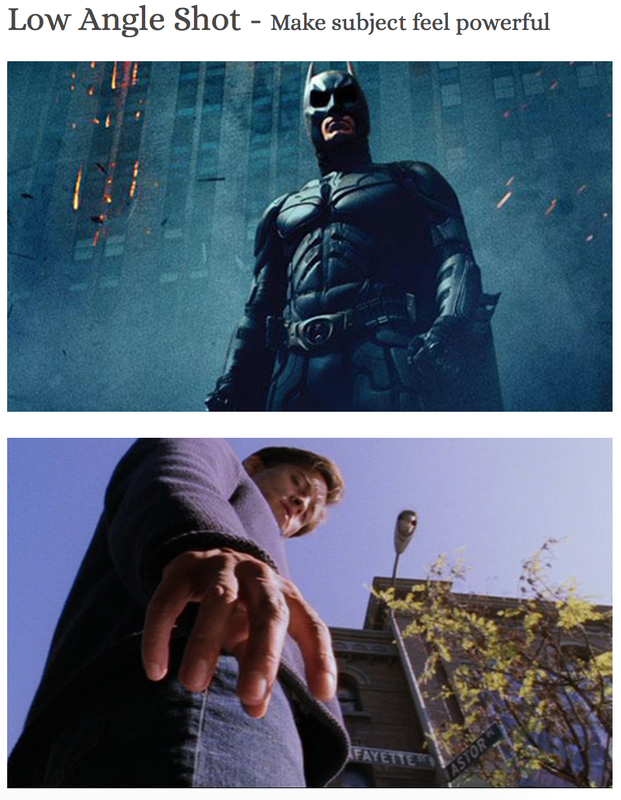 Some examples of cinematic techniques are a long take, Hitchcock effect, silhouette/backlighting, montage, or rack focus. The technique will be revealed well PRIOR to Day 1 for students to practice and prepare AND IS OPTIONAL. There is an AWARD for Best Use of Technique. Using these different cinematic techniques alll depends on the subject of your film. You want to make sure you are using them for a purpose, not simply for the idea of using them. Silhouette Lighting may be used to hide a subject to create suspense. The Hitchcock Effect, also known as a dolly zoom, is commonly used by filmmakers to represent a feeling of unreality, or to suggest that a character is undergoing a realization that causes him or her to reassess everything he or she had previously believed. 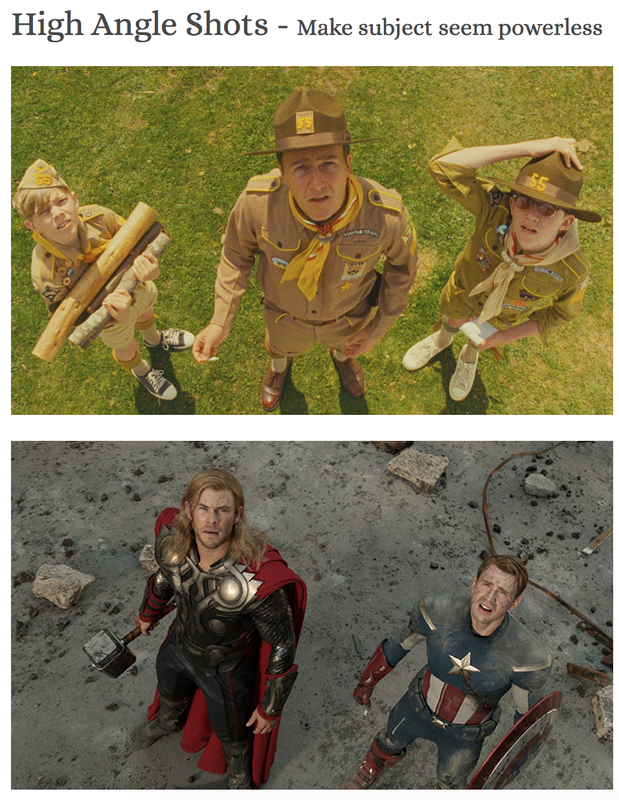 The Long Take can used as an establishment shot or during an opening credit sequence, for example. A Montage is a series of short shots which are edited into a sequence to condense space, time, and information. A Rack Focus is when you shift the focus from one part of the frame to another. 100% REQUIRED FOR ALL FILMS. Many teachers find it helpful to incorporate some of the elements of the 10 Day into other projects throughout the year. For example, students may make a PSA. Why not have them use a specific line of dialogue in the PSA? Other schools do a practice round of the Challenge. This may help students with pacing for the real thing. Finally, make sure everyone is familiar with the GENRES. Do a lesson where the students research the types of films that fall under the genres used in the 10 Day. And, of course, the rules. 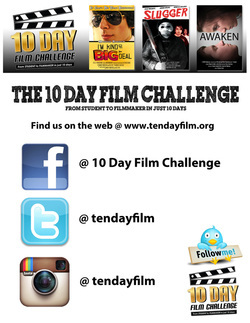 Students should know the rules of the 10 Day Film Challenge. What to do with large groups of students? It may be difficult to keep large groups of students busy for 10 days once the pre-production and shooting is complete. 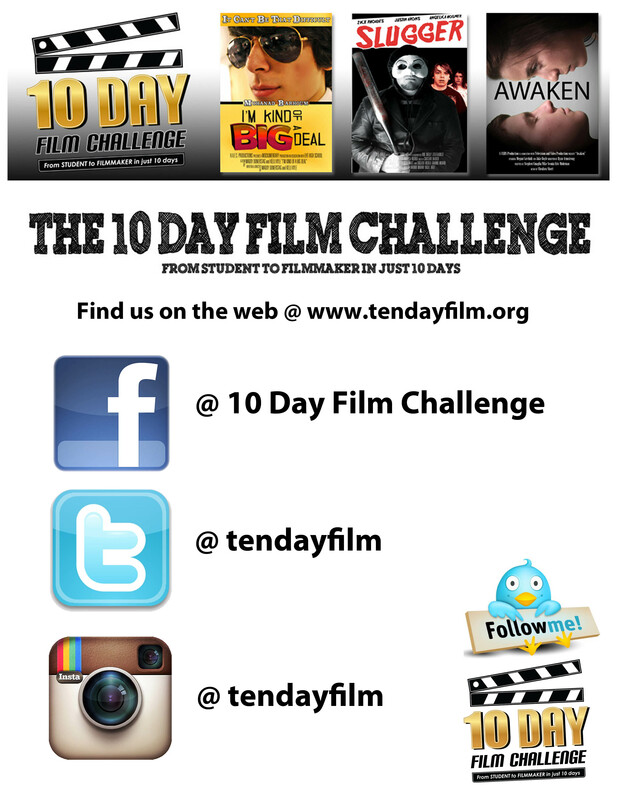 Some schools use the last 5 days of the challenge - while only 1 or 2 students are actually editing the finished film - to have students make "director's cuts", "behind the scenes docs" or "movie trailers" for the film. Those can be assignments you can use for additional grades in your class, but are NOT required for submission in the 10 Day Film Challenge. See the video below.